Through the bazaar’s vaulted stone passageways, the coppersmiths’ hammers tap-tap-tap patterns onto platters and bowls. Spice merchants heap chromatic cones, geometrically shaped to fill the air with scent. Shoemakers line their windows with handmade, cherry-red leather slippers, each tip curved delicately upward like a crescent moon. Every piece of merchandise, it seems, proclaims that Gaziantep (gah-zee-AHN-tep), in Turkey’s southeast, is proudly alive with artisanal traditions. And what Gaziantep is most proud of today is crafted not in its bazaars but in its kitchens: baklava, the sensually syrupy pastry of layered, paper-thin filo dough and crushed pistachios, first beloved in the bygone Ottoman Empire and today on menus and grocery shelves worldwide. 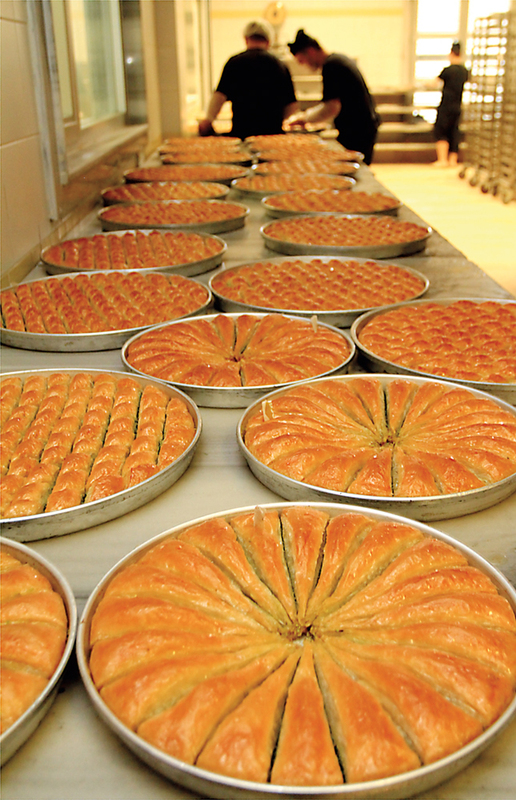 Gaziantep’s baklava, locals say, isn’t just good: It’s the world’s best. That being quite a claim, I’ve come to investigate. So many bakers, says food specialist Filiz Hösükoǧlu, means "there is great competition," and this "creates ambition to be the very best." 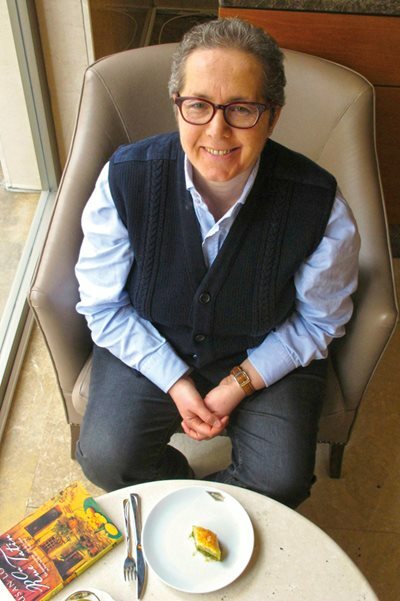 Accompanying me through the bazaar, where beyond the shoemakers, glass-fronted baklava cafés vie with one another in their temptations to the peckish, walks Gaziantep native, food researcher and writer Filiz Hösükolu. I ask her if she believes the baklava hype. Geography has also favored Gaziantep, which lies along a major trunk of the Silk Road, the historic network of land and sea routes that wove together the empires of China and Asia with those of the Mediterranean and Europe, and which flourished for more than 1,500 years from the second century bce. “When people travel the Silk Road, they bring ideas, have conversations. This is why Gaziantep cuisine is so rich,” Hösükolu tells me. For as well as its baklava, the city is renowned for its kebabs (meat, vegetable and fruit), bulgur wheat meatballs (köfte), dried aubergine (eggplant), stuffed grape leaves (dolma) and more. So confident is Gaziantep of its traditional cuisine that the city recently submitted its baklava to the United Nations Educational, Scientific and Cultural Organization (unesco) Intangible Cultural Heritage list, hoping it will join the recently accepted Turkish coffee. But among all, it is the baklava for which Gaziantep cuisine is best renowned, even though the pastry is anything but unique to this city, or indeed even to Turkey. It’s on the dessert menu throughout western Asia and the eastern Mediterranean, and it enjoys many regional characteristics. Perry goes on to assert that some of the first recipes for what we would today recognize as baklava appeared in an early 16th-century Persian cookbook Karnameh dar Bab-e Tebakhi ve Son’at-e An, although he has also found a recipe for a dish that has some similarities with modern baklava in a 13th-century Arabic cookbook, Kitab al-Wuslah ila al-Habib, in which the pastries are fried crisp and topped with sugar, rosewater and pistachios. But it was in the royal kitchens of Istanbul’s Topkapı Palace, during the 15th and 16th centuries, that according to Perry, the type of layered baklava familiar to 21st-century consumers probably evolved. And it seems that, even in its very earliest incarnations, baklava was a special dish, one fit for ceremonial occasions. Syed Tanvir Wasti, emeritus professor at the Middle East Technical University in Ankara, records a procession called the Baklava Alayı in which the sultan presented a “tray of baklava for every 10 janissaries [on] the 15th day of Ramadan”—a practice that ended in 1826 with the disbanding of the elite-corps janissaries by Sultan Mahmoud ii. Today, it is still something of a festival dish in Turkey, one served most frequently at engagements, weddings, funerals and religious holidays such as ‘id al-fitr and ‘id al-adha. In Perry’s two early Persian recipes, however, the baklava was filled with lentils, rather than the nuts common today (although in Istanbul, palace recipes for baklava with a chickpea filling appeared as late as the 19th century). Today it is for pistachio nut fillings that modern baklava—particularly the baklava of Turkey—is best known. Pistachios are a key ingredient in a dish that has only seven (not counting the syrup): durum wheat flour, eggs and salt for the pastry, milk and semolina for the kaymak, or cream, which is added to the pistachios for the filling, and clarified butter. According to Efkan Güllü, owner of the baklava shop named Güllüolu Efkan Güllü and whose ancestors opened the first Güllüolu in 1871, it comes down to the sheer quality of these ingredients to impart to Gaziantep baklava its unique flavor. 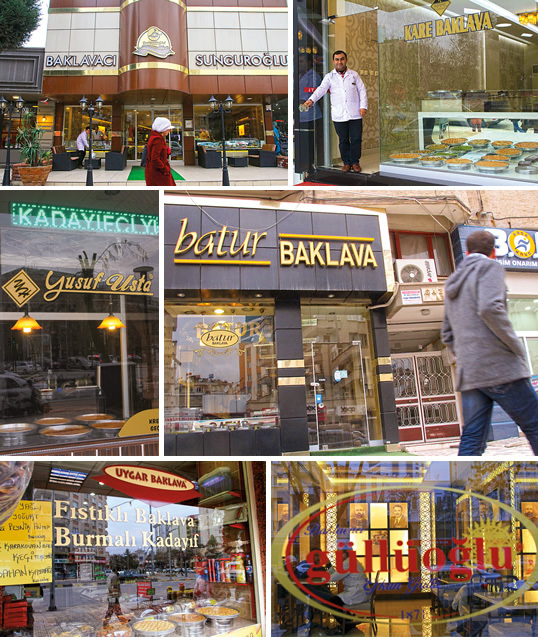 Now, Güllüolu is a national chain, with branches throughout Turkey and beyond, including New York City. Güllü is showing me around his warehouse for baklava production. First, there are the pistachios from Gaziantep’s renowned pistachio orchards. Those pistachios destined to fill baklava are picked early in the season, when they are small and sweet. “The nuts are harvested only during the first week of August when they are green. If we don’t take them from the tree when we do, just one week later they will be too yellow and we cannot use them for baklava,” he explains, referring to the larger, more mature nuts that end up packaged as snacks on the world’s supermarket shelves. Then there are the tubs of butter, bags of sugar beet for the syrup and sacks of durum wheat flour, all fastidiously arranged. He offers to demonstrate how baklava is made. Baklava filling is called kaymak—a cream of milk and semolina—and it is mixed with the ground pistachios, the most expensive ingredient. 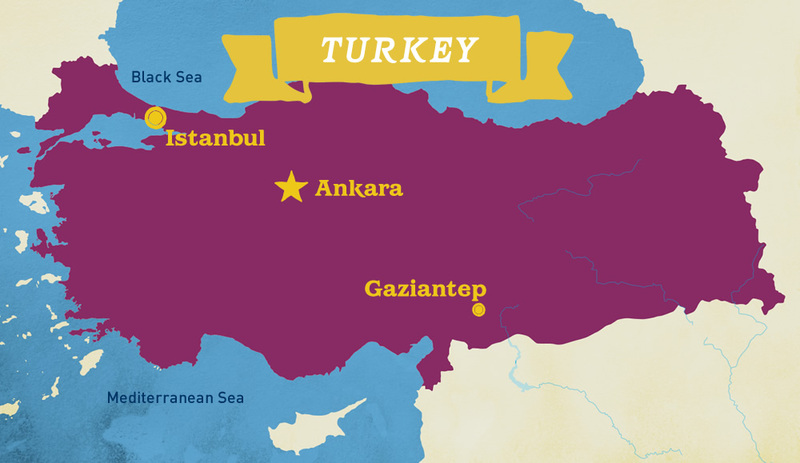 Gaziantep is near some of the world's best pistachio orchards, and most of its baklava contains about one-fifth pistachios by weight. Below, a tray of baklava bakes for 25 minutes at 200° centigrade (392° F). 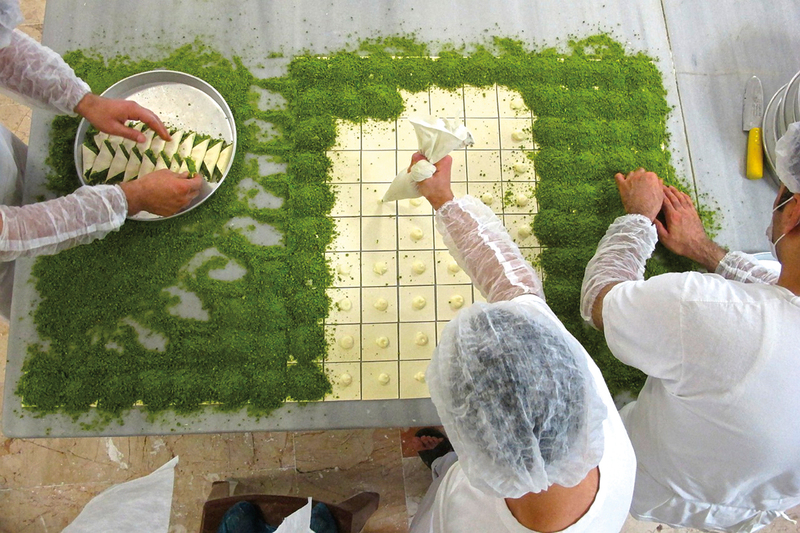 “We start at about 3 o’clock in the morning,” Güllü says, showing me into a large kitchen where teams of chefs, all dressed in crisp white aprons and neat caps, are working on different stages of the production. First, the pastry chefs feed a lump of dough into a mechanical roller. This begins the process of flattening the dough before it’s rolled by hand with a wooden rolling pin on a marble slab, which keeps the dough cool. The sheet of yufka (filo) becomes thinner each time it’s smoothed, and it is generously sprinkled with handfuls of wheat starch to prevent it becoming sticky. It’s utterly mesmerizing. 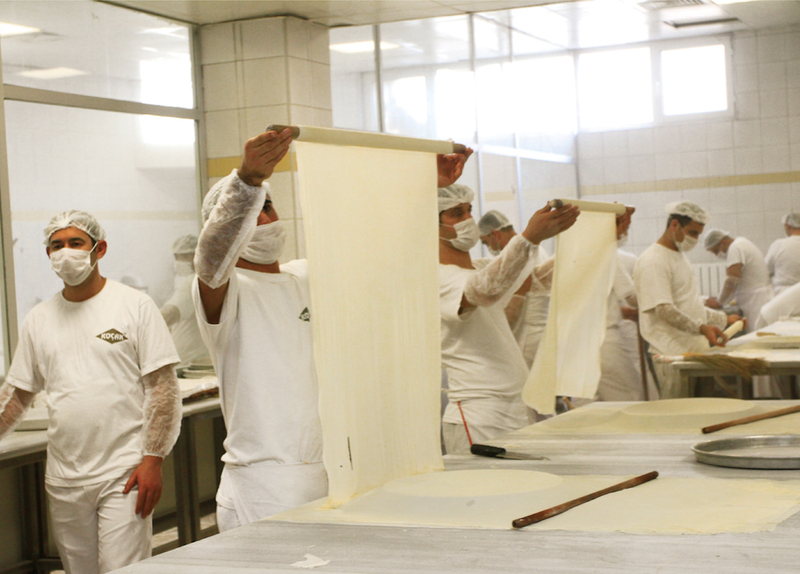 “You can only get this thin doing it by hand,” explains Güllü, who holds a piece of his company’s wrapping paper behind the sheet to reveal that the dough is so thin you can read through it. After around 15 minutes of strenuous hand-rolling, the dough is stretched across a circular tin and cut around the circle before another layer is added. “This will be the top of the baklava, and we use the cut-off edges for underneath, so nothing is wasted,” he continues. The chef works quickly. The layers are so fine that the dough can soon become dry and unusable. With a flat knife like a spatula, he spreads the kaymak into the dish, and then covers it with a generous layer of green pistachio pieces. More layers are added, until the dish contains around 40 layers of yufka with clarified butter spritzed between each one. The baklava is then cut into the traditional diamond shape, although squares and triangles are also popular. More warm clarified butter is poured onto the mixture before it goes into the oven, the furnace lined with black stones from nearby Islahiye and fired with oak wood. 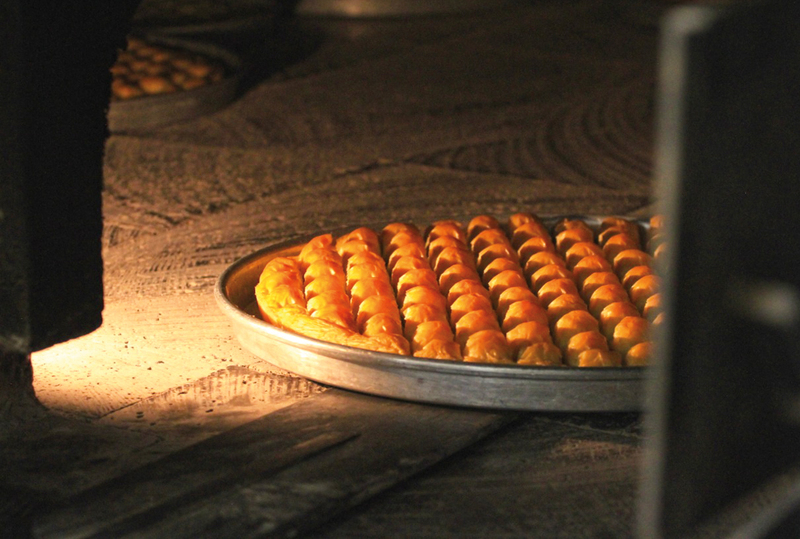 Here the baklava bakes for exactly 35 minutes, at exactly 200 degrees centigrade (392° F), in precise accordance with Gaziantep’s Chamber of Industry’s regulations on baklava production. When it’s ready, the head chef—in this case, Güllü himself—pours the syrup, heated to precisely 108 degrees centigrade (226° F), onto the cooked baklava. It’s cooled on marble for around 20 minutes before being packed, sold in the shop and eaten—ideally within four days. This entire, labor-intensive process has taken one hour. I feel privileged to have witnessed it, as for many Gaziantep baklava producers, manufacture is a carefully guarded secret. Another Gaziantep baklava maker, Burhan Çadaş, owns Imam Çadaş, a baklava shop whose roots go back to 1887. Over a plate of his baklava in his restaurant in the city center, with the medieval citadel, baths and caravanserai nearby, I ask him why people say Gaziantep baklava is the best. “It’s not just my opinion. I was part of the team that went to Brussels last year to register our baklava with the European Union for protected status,” he tells me. 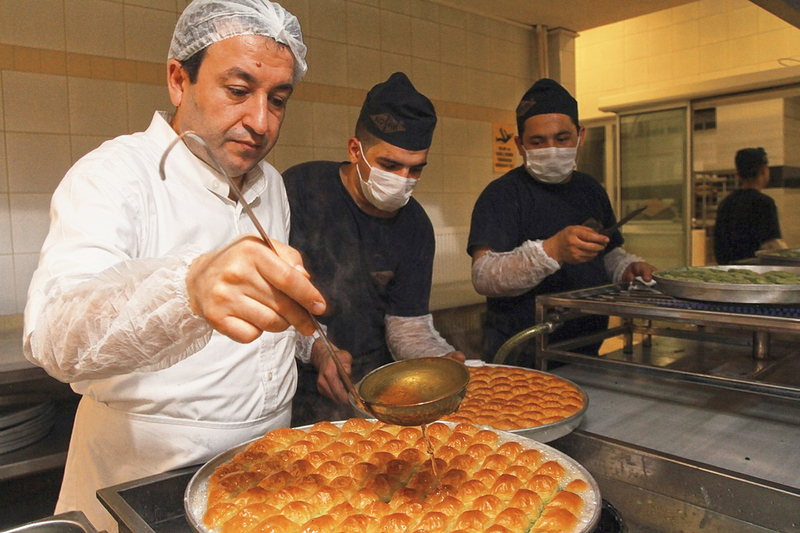 Gaziantep’s baklava is the first Turkish product to receive the coveted status, which stipulates that only baklava that is both actually from Gaziantep, and that also follows rigorous production criteria, can carry the description “Gaziantep baklava.” Çadaş thinks he knows why the bid succeeded. “We have the best ingredients, all of them carried on the Silk Road,” he says. The wheat comes from nearby Harran, where the soil is not irrigated—ideal conditions for the hard durum wheat. The butter comes from the Tektek Mountains, an area where, according to Çadaş, the grazing is rich with native flora, which imparts to the clarified butter its distinctive flavor. And then there are the famous Gaziantep pistachios from the orchards that surround the city. “The best ingredients make the best baklava,” he concludes. So confident is Gaziantep of its baklava that the city recently submitted it to unesco’s Intangible Cultural Heritage list, hoping it will join the recently accepted Turkish coffee. There is yet another ingredient, Çaǧdaş adds: workmanship. The qualities of a baklava chef are honed through a minimum of 10 years of training. “The chef who makes and rolls out the dough cannot talk. He cannot think about anything other than baklava. He must be fit. He is only allowed to roll out the dough until the age of 35. Baklava chefs are like football players!” He goes on to say that in the kitchens, even negative body language is not allowed. ”Baklava chefs must always look happy,” he declares. In the 1940s and 1950s, before Çaǧdaş was born, baklava producers would lock their kitchen doors to keep safe the company’s secrets, but it’s local lore that some producers nevertheless learned rivals’ techniques by peeking through the keyholes of their doors. 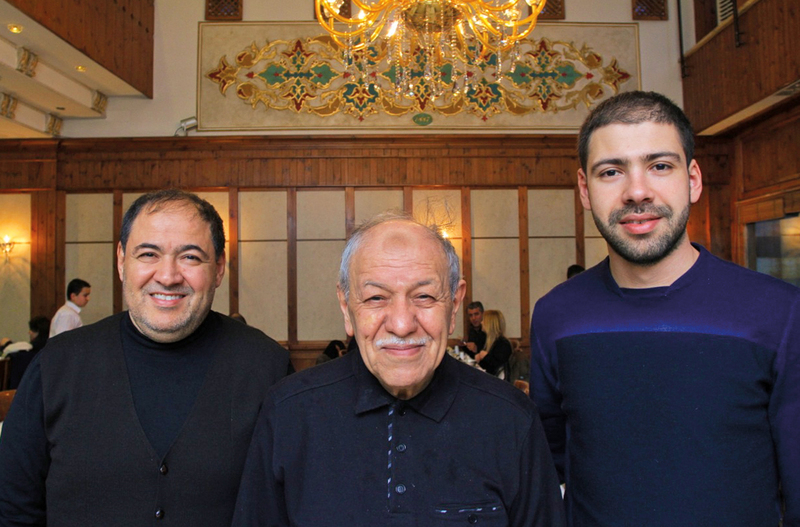 Owners of the baklava bakery named Imam Çaǧdaş, which opened in 1887, Burhan, Talat and Talat Çaǧdaş are among the city's multi-generational baklava families. Ready for sale or shipping, each Gaziantep baklava wraps its filling in some 40 layers of filo. I leave the restaurant and wander the old caravanserais (hans), testimonials to this city’s former prominence on the Silk Road. Many are now shops and restaurants patronized by the tourists and shoppers who throng the nearby bazaars. In a busy street just outside the covered part of the Elmaci Bazaar is the shop of baklava maker Elmacipazari Güllüolu, and it is owned by brothers Cevdet and Murat Güllü, kinsmen of Efkan Güllü. Its tables are filled with people savoring the pastry, washing it down with fluted glasses of sweet tea. Two men in smartly pressed business suits tell me they are from Ankara, the Turkish capital. I ask why they came to this particular shop for baklava. “It’s so light and tasty,” says one. “In Ankara you can only eat one slice, but here I can consume four slices easily!” They go on to say that everyone has their favorite baklava producer, and will return to that same one, time after time. To do otherwise, he says, would be tantamount to betrayal. “It’s like having your favorite football team. Just as you cannot change your team, you cannot change your baklava maker,” he says as his fingers sweep from his plate the last sweet crumbs. Historian and travel writer Gail Simmons surveyed historic buildings and led hikes in Italy and the Middle East before becoming a full-time travel writer for UK and international publications. She holds a master’s degree in medieval history from the University of York and is currently earning her Ph.D. She lives in Oxford, England.